Take another look at the holiday mail - surprises abound! If, like me, you don't get round to sorting the Christmas card envelopes that you receive yourself, and from family and friends' hordes until some time in January you should look out for one that is not all it seems. We all get a lot of red envelopes at Christmas, addressed in a variety of styles. This one looks like any other unless you really look at it. The two rows of numbers are the clue, and if you look closely at the apparently 'written' address it is printed with an ink-jet or laser printer in 'joined-up' script. Look closer at the stamp and you will see that it is the 2015 coil, this time sent courtesy of the Holiday Property Bond. The other thing that you may see on your Christmas post - if it is postmarked at all - are examples of the old Universal-style postmarks. 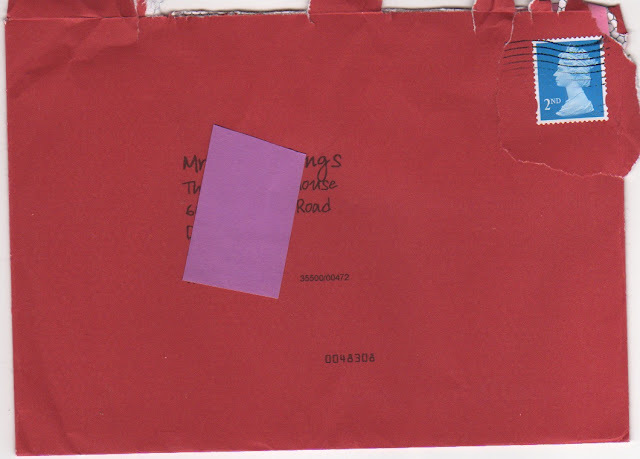 These ought to be a better clue as to where the item was posted than the 'area' ink-jet postmarks. (I was told that some mail from North Norfolk was sent to Chelmsford's South East Anglia MC) instead of being processed in Norwich, or even Peterborough as is often the case. Here's an example of the Chelmsford Universal machine with the Please Post Early 'Snowman' slogan used on 17 December - along with the normal South East Anglia MC 'Last Posting Dates' slogan. Over on the Stampboards forum some members are recording their finds - but they are few and far between. So if you have any contribute please pop over - or, if forums are not your thing, send me your image and I'll add it to the records there and for the British Postmark Society.